Today is the day after I returned home from three intense days at the HCL factory tour in Milano, Italy. I wanted to blog a lot earlier about the event but did not find the time due to the jam packed content-filled and socially busy days and evenings. First and foremost - HCL did a great job in letting us look under the covers of what they have planned and are planning on doing. And this time, it was not only about technology and next-version products plans but also on how to do business and how to interact with HCL going forward, be it as a customer or a (potential) business partner including things like sales margins and how to handle license deals. Jeff set the stage for the whole of the three days with the theme for Episode 2: A New Base - A New Hope - A New Beginning. With the delivery of Domino 10 and the efforts to keep the existing customers and partners around the portfolio, a new base is being established. Jeff reported about what got delivered and about the market buzz and the reaction in the community and about the amount of customers coming back in form of reinstatements of software maintenance. Beyond the base, the looming deal with IBM to bring huge parts of the ICS portfolio over to HCL is considered as the New Hope and it certainly is a New Hope for a lot of the products like Connections, Sametime and Portal. While the deal is still being handled between the two companies, it held back a lot of questions to not being able to communicate them right now, especially on all things HCL didn’t have the IP already (like N/D) - so Connections is still in the blackout period here. This was a bit of a downer to some in the audience but currently there’s no way around that. After the high-level overview, we heard about the plans for Domino V11 by Russ Holden. In a short retrospective, Russ talked about what went well in the V10 launch and what did not go so well (like the language pack hickups) and what is about to change in the future. PUB/SUB feature supports hooks to DB and Document Events ! 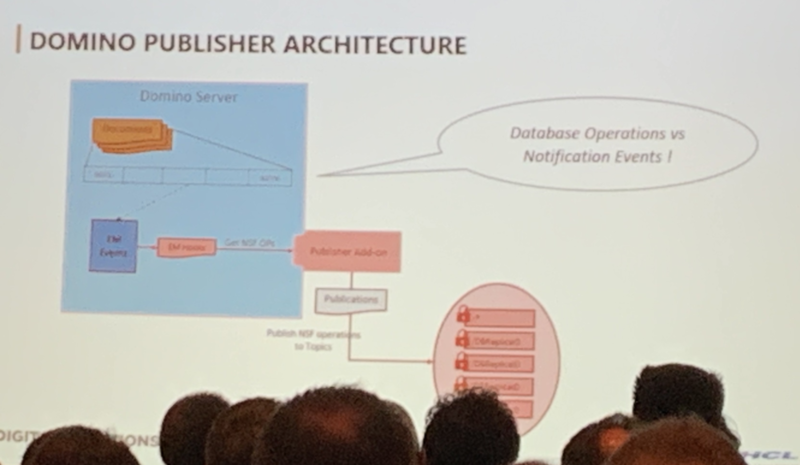 Domino 11s pub/sub feature will allow applications to subscribe and get immediate notifications - no polling. keeping Notes and HTTP PW the same ! After the Domino V11 updates, I went to the session with John Curtis about the AppDevPack. The AppDevPack will be published in quarterly releaes, with version 1.0.1 due in Q1. V1.0.1 will include support for Windows Server (Proton that is) and will see the IAM OAuth2 feature no longer being a preview but coming with a simplified and a lot easier setup and installation. There will also be a quick setup for development environments. Dominodb will allow streaming of large datasets. Next up was Max Sutton, talking about HCL Nomad and future plans with Mobile Apps. Code has been compiled using OpenGL and WebGL so technically, it can run as a WebAssembly component in the browser ! This was the first session about HCL places and the ideas to build a new Low Code to Pro Code Development platform using Open Source components on top of the former ICS portfolio. Andy and Michael and Andy presented the basic discussion on how HCL wants to open up the portfolio to new audiences and gain new customers to be moved onto the platform. 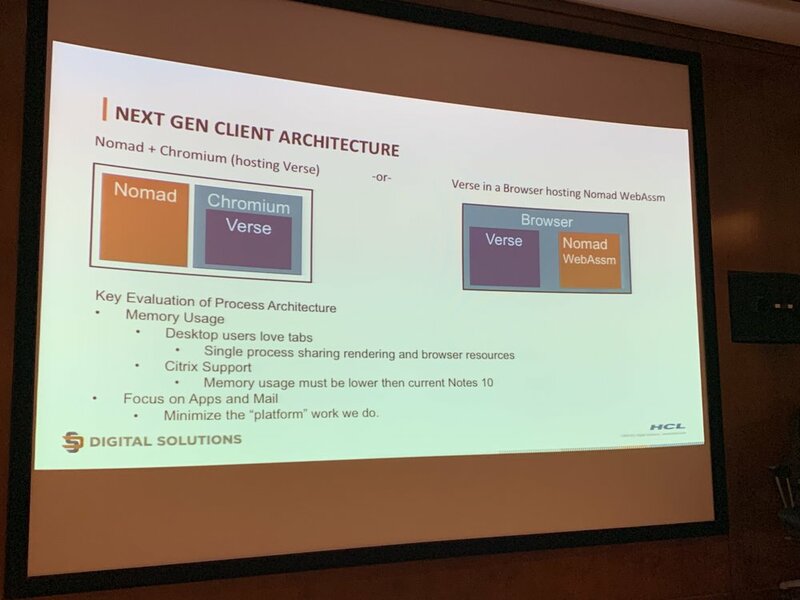 In contrast to earlier presentations around places, they did not show any demos/live code as they are currently laying out the foundation for this new offering and have no finalised feature set yet. There intention at the factory tour was to let the community be a a part of this new venture from day 1 onwards while they made it very clear that there might be overlapping with over parts of the portfolio (especially in the low code area) but they also made very clear that HCL will be stepping down that path, no matter what. What is HCL places ? Andy setting the stage… . Day one was finished up by a presentation of John Immerman about Client Advocacy and Support - especially the Client Advocacy Program is something that every customer should make use of as it connects your organization with a single entrypoint in HCL to help you along with whatever questions may arise. Day 2 started with Jeff’s kick off again and a retrospective of points taken the day earlier by his management team. A really interesting feedback round on what his team took with them as their impressions from day 1. Day 2 saw a lot of things around new clients. Barry Rosen and Andrew Davis presented Verse 11 and Andrew continued the discussion around clients by showing design ideas around the rich client and a new notes mail interface as well as he talked about the new lightweight client based on the WebGL components from Nomad. Andrews chart of the next gen client architecture alternatives. No news on Designer or XPages where given here. The great session on next gen clients was followed by an outlook on Sametime V10/V11 by Pat Galvin. I short - no news on simplifying Sametime back to an easy-to-deploy environment, on the contrary. We still need the proprietary proxy server and the persistent chat feature on prem will require MongoDb for storage. Me and a lot of the others in the audience have been making clear that we are not happy with the idea to having to bolt yet another third party component underneath the wonky sametime stack for a single feature. Also, containerization will come later and the return of Domino as datastore will be stretched as well. So the Sametime team really continues on the IBM path - overpromising and underdelivering. So sad. During Day 2 we had a lot of break out discussions around business administrative things like sales processes, partner programs and also first ideas on transfering the IBM Champions into a “HCL Heroes” program (working title) as well as an interesting talk with Uffe Sorensen about the impact of having an app store for HCL portfolio applications both as an internal appstore as well as a public facing external appstore. I can’t say that conclusions where reached but the discussion that started in the V11 jams was definitely picked up by HCL which I like a lot. Day 2 finished off with another keynote by Volker Weber - he already posted a recital of his presentation on his blog. His perspective on the New Base - New Hope - New Beginning theme was truely inspiring. Day 3 covered the DX portfolio - Portal et all - I will return to this in a later post. To finish off this first post I need to say a big thank you to HCL and especially to Richard Jefts team. They did an amazing job and have been open and transparent throughout the days, always interested in hearing peoples opinions and sitting down to talk about details that have not been covered in the presentations. The even shared their concerns about having too much on the plate now to digest and work on it in their expected speed. I really felt this have been open and frank discussions with people that are honestly trying to make an elephant dance (to stay in the picture of VOWEs cloning thoughts). I found this to be refreshing, inspiring and motivating. I was really impressed. We had great hosts and hey, if I ever have the chance to visit another factory tour - I will ! A couple of things have been left open as plans are not finalised here - the future of XPages is still not clear besides the statement that it will be supported onwards. Domino Designer will be revamped - to what is still out of scope to be discussed. The Sametime story is the only real downer for me - I was hoping for more in a shorter timeframe - with WW being killed, momentum for Sametime is there but I don’t think HCL will be able to execute on it. So, did they deliver on their theme “A New Base - A New Hope - A New Beginning” ? They certainly did. Will they succeed ? I can’t honestly tell but I met a bunch of very determined people really trying and working hard on pulling something off here. That alone makes me feel ok with “A New Hope and A New Beginning”. Way to go, HCL ! We’ll be here to do our share !